Cleaning up your garden can be a satisfying task. Even though I struggle to get motivated to do it, once I’m doing it, it feels cleansing, like a deep breath. Doing a fall garden clean up gives you the best jump on a spring planting. Come spring, you’ll just need to remove leaves and add mulch instead of hunting for the dirt underneath the old plants. It’s also the best way to reduce the spread of pests and disease that could overwinter in the plant material. These tips mostly apply to places with distinct season, especially cold winters. If you are closer to the equator, it would still be good to go through these steps periodically. This is important. Take notes of what you grew and where. It doesn’t have to be perfect. For example, I forgot to take notes about the types of peas I planted. I wish I did because only one of the three bean plants were actually yummy. Oh well! Something to learn for next year! But my notes this year will mention the types of peppers, cherry tomatoes, and eggplants that did very well. All of them came from the Freville Farm plant sale. My notes will also say how nice it was to sunflowers, zinnias, nasturtiums, and marigolds throughout the garden and that the squash plants definitely need A LOT more room. Knowing where you planted what will also help you with rotational plantings over the next few seasons. Crop rotation helps to reduce disease, improve soil health, and confuse garden pests. The same plants in the same location year after year will reduce your yields. A few simple notes will help you pick the best locations in the spring. If the plants are covered in fungus, powdery mildew, and other disease, pull them and put them in the trash or in the woods, far away from the garden. I don’t like the idea of wasting space in a plastic bag for organic matter so I add it to our brush pile that won’t be back in the garden. This pile includes invasive plants like barberry plants and grape vines. Even though these would eventually break down and compost in the dirt, you don’t want to leave traces of it around to jump on next season’s plants. This isn’t the same reason for removing the sick plants. It’s to clear out the beds to get ready for spring. Unlike the sick plants, you can put these into the compost bin or even trim them and bury them into a trench. For bean plants, you can leave the roots within the ground to release nitrogen back into the soil. 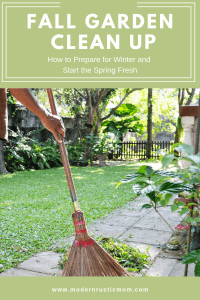 By preparing the garden beds now, even though they still have to go through winter, they’ll have a chance to rest, be filtered with water, and regenerate. Winter cover crops will recharge the soil with nutrients, prevent erosion, and reduce weed growth when the soil warms up. Good winter cover crops include: winter rye, hairy vetch, buckwheat, red clover, or a cover crop seed mix. Mulching happens throughout the year. Mulching in the fall is mostly to protect from winter freezes and harsh winter winds. With some organic matter, it will also help give the plants a head start in the spring. Typical mulch materials could range from dye-free mulch, shredded leaves, grass clippings, and chopped leaves. You can put the ‘tidier’ mulch in the more visible areas but put the right mulch with the right plants. Put more acidic mulches like pine bark and pine mulch with acid-loving plants like blueberries, rhododendrons, and daffodils. Late fall and winter are the best time to catch up on chores that had to be ignored during the height of harvest. If you use wooden fence posts, review the the posts and rails for damage. Make a list of the number you’ll need and order them. Even if you don’t get to replacing them until the snow flies, you’ll have a head start. It’s also a good time to consider if it’s the right fencing for you. Were small animals making their way into your garden? It might be time to consider electric fencing or burying chicken wire. Were deer leaping over your fence? Time to raise the stakes, literally. Or maybe, you’ve been waiting for extra funds for an upgrade. Take measurements and visit local hardware stores. They may be willing to move some inventory before winter. This summer, I bought two systems of soaker hoses to make irrigation easier. And who would have thought, it rained almost every other day for the rest of the season. The soaker hoses were never needed. To preserve my investment, I’ve picked them up from the garden and carefully wound them back up to be ready for next season. They have been rolled up and put together in a bag with the connection pieces. For larger hoses, roll them out and try to put them on a slight downhill to drain all of the water. Then re-roll them and tuck them into your shed or garage. If you are in a hard freeze area, be sure to drain the water from the relief valve then cover the outside with a hose bib cover. Pitchforks, shovels, hand tools, clippers… It’s time to bring them together and clean them with soap and water. Not only will this remove dirt, it’ll remove any lingering disease or seeds from the season. You can go a step further and soak the blades in a water and bleach solution to destroy any pathogens. You may need a wire brush to reach into crevices. If you see some rust spots, use steel wool or medium grit sandpaper to scrub it off. Let the equipment dry completely. If they don’t dry all of the way, they will quickly rust. Once they are all dry, spray the joints and blades with some lubricant oil and store in your shed. One of the best parts of the season is enjoying the beautiful colors and the warm sunshine mixed with a cool breeze. Enjoy a few more hammock naps or nature hikes before it turns cold. 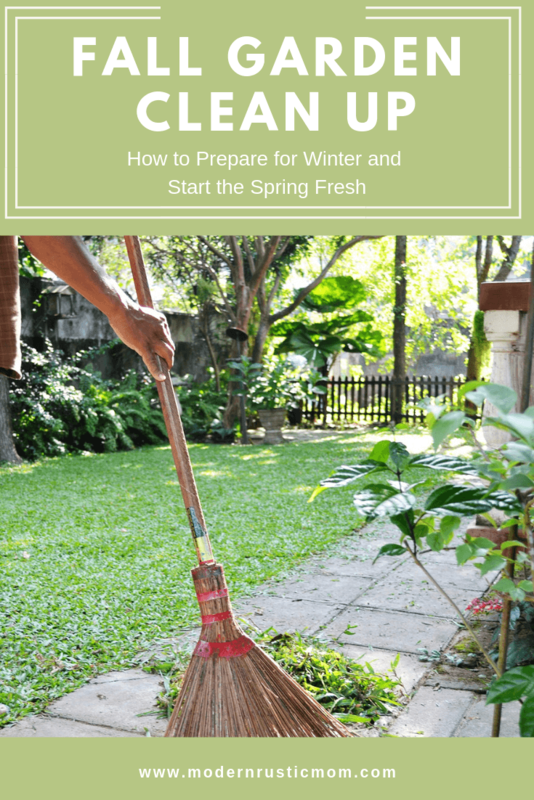 Then turn your thoughts to winter and start planning what you will bring about in the spring! Have you started your fall clean up? What are your fall plans?